Masala Aamboli is a specialty from Southern Konkan / Coastal India. 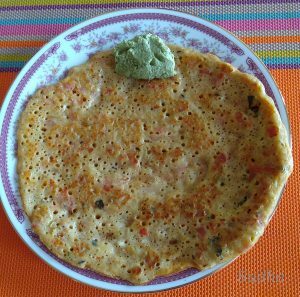 Aamboli is like an Uttapam (South Indian Pan Cake). 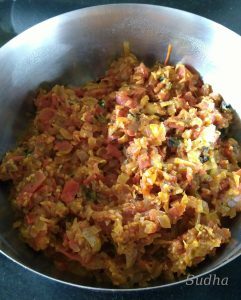 Instead of adding raw Onions and Tomatoes, a spicy subji is cooked and added to Aamboli batter. 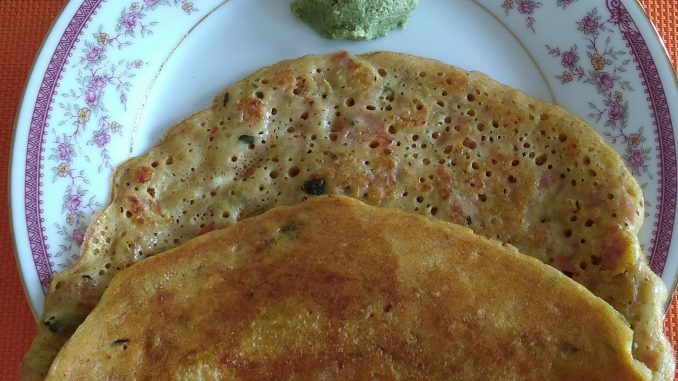 Hence it is tastier than Masala Uttapam. 1. Wash split black gram (urad dal) and rice separately. 2. Add Fenugreek (methi) seeds and Poha (flattened rice) to rice. 3. Soak both split black gram (urad dal) and rice + fenugreek (methi) seeds + poha separately in water for 8 hours. 5. Mix both batter and keep covered for 8 hours. 6. Add salt and mix well, the batter consistency should be like pan cake batter. 1. In a pan, heat oil. Add cumin seeds; wait till splutter; add turmeric powder, asafoetida and curry leaves. 4. Add tomatoes. Mix. Cook covered on low flame till tomatoes are soft. 5. Add chilly powder, garam masala, mango powder, Salt, chopped coriander and mix. 6. This Masala should be spicy as we are going to add it to Aamboli batter. Adjust spices according to your taste. 1. 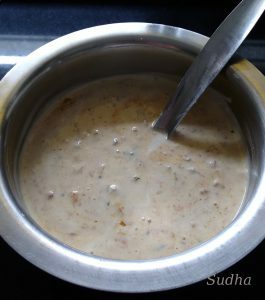 Take out 5-6 ladle full of Aamboli batter and Add the Masala / Spicy Mixture to it. The amount of Masala to be added depends on your taste. More the Masala; Ammboli will be more tasty. 2. Heat a flat non stick griddle on low flame. 3. Sprinkle water on the heated griddle, wipe with cotton cloth before spreading the batter. 5. Cover the Aamboli with a lid. 7. Flip Aamboli and let it cook on the other side. Cooked Aamboli will be reddish brown in colour. 8. 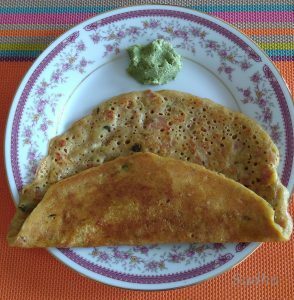 Serve hot Masala Aamboli with your choice of chutney or tomato sauce.